The first step of the formal strategic planning process is to complete a strategic analysis, where you will review the businesses internal and external environments with a view to completing a SWOT analysis. This SWOT will be used as an input into the development of strategic options and making a strategic decision. 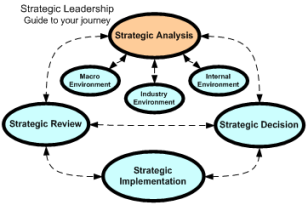 With a solid grasp of strategic analysis you will be improving the quality of your strategic decisions. To assist you to do a great job I have included detailed templates for each section of your analysis. This is the investigation/research stage of developing your strategic plan. Once grasped strategic analysis is also the foundation skill and most used skill in strategic thinking. The macro environment analysis looks at factors that affect many industries, such as changes in interest rates. The things that may affect your industry as a whole may also affect many industries, such as interest rate rises, however you are only concerned with the things that affect your industry. The industry environment analysis looks at factors that affect the industry, the profitability or competitive position of the industry. For example deregulation is making it easier for non-banks to enter the home lending market which inturn increases pressure on banks to run with lower interest rate margins. For example: If you have limited financial resources don’t develop a strategy that requires a lot of investment.